Presented here is a very basic MIDI Step Sequencer for Pure Data. It's locked to playing 16th notes, but the tempo and number of steps can be changed. The pattern can also be transposed. Finally, it comes with a decent random pattern creation system, ideal for that 'dead batteries in a 303' style sequence. The top right window displays the pitches for the steps, selectable between -12 and +12 semitones. The center right window the velocity (where 0 means no note is played). The bottom window shows the currently playing step. Obviously, as a MIDI Sequencer, it doesn't actually produce audio on it's own: you'll need to route the MIDI to the instrument of your choice. The patch itself is fairly simple; there's nothing in there a novice Pure Data-er familiar with basic messaging and lists couldn't grasp. Adding multiple pattern support would be a simple, yet interesting addition for the eager coder. 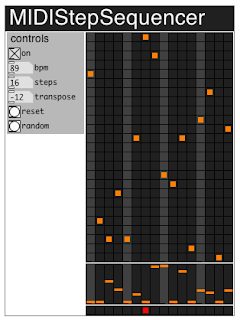 Here's a short audio demo of it at work: here, MIDI is output from Pure Data using the Mac IAC MIDI Driver (use MIDI Yoke on Windows) into Aspect, which is playing a nice analogue mono synth bass sound. Download the patch for Pure Data here. UPDATE: New version posted here. A short note to mention that Sequent for Linux has been updated to version 1.0.2. This fixes a rather nasty bug that slipped through the cracks of our testing: sometimes the interface would lock, or indeed crash, when changing presets in certain Linux VST hosts. Download it here.